Harbinger of the seasons – my potter’s bench. One of my prized possessions is a potter’s bench I bought for a song a few years ago. Its light-colored, lattice pine wood is now darkened in spots, weathered from being outdoors. It has a bottom shelf where I store potting soil, a watering can and remnants of the passing months. It also has a row of pegs, a larger main shelf and a narrow top shelf where I rotate in the news of which time of year is coming. My potter’s bench has become my own personal corner of the world to decorate as I please and herald in the changes that accompany life in New England – a harbinger of the seasons. Each winter I move a small, old-fashioned style red lantern to the narrow shelf, accented by placing next to it a small clay pot with two pine cones. These are magical pine cones. They are the last two my mother collected before her passing in 2010. Collecting pine cones was an annual ritual for her – most were used on homemade wreaths but then there were a precious few she held on to as mementos. With the arrival of the first snowfall it has become an annual ritual of my own, to peer outside my back window and watch the flakes gradually cover the potter’s bench, and settle on the lantern and Mom’s pine cones. By January both the lantern and pine cones are covered by inches of snow. But that’s alright, winter was Mom’s favorite season and she loved snow. Come springtime I clear away the winter debris and move its accessories to the lower spot to wait their turn until the snow flies again. Spring and summer are busier on my potter’s bench, filled with seedlings and later plants that strike my fancy cradled inside pots of varying sizes – some clay, some designed and a couple big ones in solid blue, as well as, a tall, talisman tone metal daisy that I stick in the ground to stand as a sentinel on the right side of the bench. Now of course summer is drawing to a close. Cooler temperatures have already arrived, some trees have begun “to turn” in patches of color and one in my backyard is shedding tiny “leaf- ettes”. So, this past Sunday morning seemed the perfect time to pull on my “Connecticut Football” sweatshirt, clear away the signs of summer from the potter’s bench and replace them with calling cards of the approaching season, my favorite. 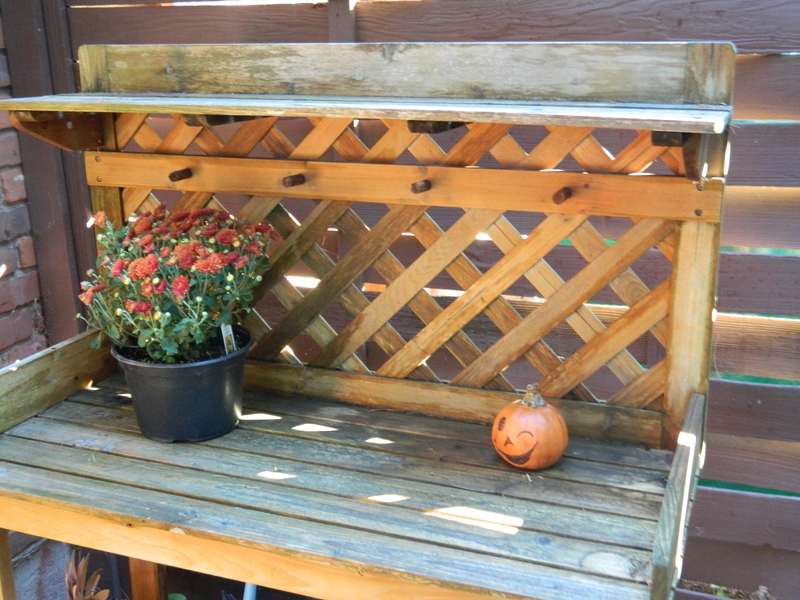 Now when I glance out the back door as the sun rises, I am greeted by a lovely auburn colored planter of mums. Sitting nearby is a recent find, a rather coy, ceramic pumpkin – winking “good morning”. Welcome autumn!